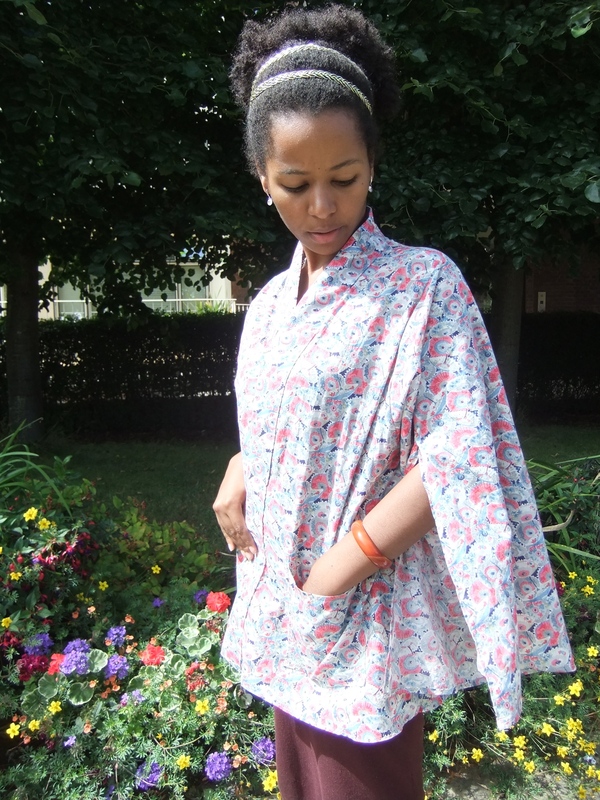 When my mum saw my completed Asaka Kimono she immediately ordered one for herself. Floor length, of course, my mum likes to sweep into a room. I fussed about it but then agreed, we bought the fabric, I started…..and then it got put in the UFO pile because a newer, shiner project called to me….that was for me. I bought this fabric back in August! So I don’t remember too many details. I got the fabric from Goldhawk Road, sorry I forgot the name of the shop. I think it was £4 per meter. When I first saw the fabric I was hesitant…..It kinda reminds me of an artistic interpretation of Camouflage Army print….but I just kept coming back to it! I do love the colours, they are sorta dreamy and calming. The fabric also reminds me of ink blot. Plus, the drape is lovely. The biggest change was to add length to the kimono. As always it wasn’t the most precise way of doing things, I added on the length I think I needed to the middle of the kimonos sides and back. Which worked out alright. I had cut something wrong and was running out of fabric, so my second change was to shorten the collar and unintentionally the kimono looks more like a traditional Japanese kimono. The pattern was the Asaka Kimono by Named. It has to be said that I find their pdf patterns the most frustrating ever. They only print out two sizes at a time (8-10 together, 12-14 together etc.) and I was making two kimonos for two different sized women. One size 10 the other size 14. So I had to print and tape the pattern together twice. I’ve been a lurker on the Named website since they begun. They are flawless in their pattern presentation and everything they do looks so sophisticated and elegant. However, I’ve always hesitated about buying anything from them because their patterns are quite pricey and they seem to be focused on a more experienced seamstress. Without seeing any sew-alongs and having no idea what their instruction guide would be like, I just didn’t think I could manage a Named pattern…but I was wrong and this is the most happiest I’ve felt with something I’ve sewed. This pattern was given a two scissor rating of difficulty (out of a possible three) which I think it was an exaggeration. This pattern has no zips, buttons or fitting issues. This sewed together very easily and I don’t think there were any advanced sewing skills/techniques needed. I didn’t have any problem following their instructions but, as I thought, it was not as thorough as some indie companies which target beginners. One thing that was interesting was that the pattern pieces were overlapping and you did have to trace the pattern, which might be off putting if you don’t like tracing. I LOVED that it was like this and had to only print and stick together about 20 pages as opposed to the usual 40+ in other PDF patterns. I have gotten into the habit of tracing patterns too, so I didn’t mind the extra step. However, you can only print out two sizes at a time, so I printed size 8/10 for me and I had to print it out again for sizes 12/14, for my mum. Which was slightly annoying…As I might of well has just stuck together 40+ pages. Also, I’ve heard other people who span across more then two sizes complain about adjusting the pattern. I know I sound a bit complain-y but I think it’s best to be told about these things before buying a pattern that is expensive! I would still highly recommend this pattern as it was such an enjoyable sew and came together so effortlessly. The original pattern seemed to be a nightgown or a dress, if you used nice enough fabric. I didn’t think I would really wear the kimono as either and I wanted it more like the light jacket kimonos you see in summer. So I shortened the length of the kimono to just-covering-the-bum length, shortened the sleeves and I also added pockets. Hoping it would look more causal-kimono-jacket like. I think I succeeded. Sadly, summer is over 😦 so I have to wait until next year to get the chance to wear it again. This pattern was such a hit with my family I’m making another two!! They are both dressing gown versions. One for my mum. She requested a floor length version (yes, Queen Mum, I am just your humble seamstress) and another is a gift for a friend of ours who is pregnant. Named have just released their new collection New Black, I’m not too keen on anything from this collection…is it just me? I’ve seen people commenting about how much they love the trench coat but everything looks like it would only suit a really tall, slim lady…. I’ve got my eye on some of their older patterns and after sewing this one I am definitely going to buy them sometime in the future.